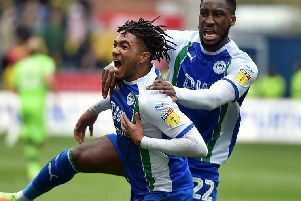 Paul Cook could not hide his pride at the way his Wigan Athletic side took the game to Championship leaders Norwich and came desperately close to picking up a vital victory. Latics had led 1-0 at the break through Reece James' penalty, and created several decent chances at the beginning of the second period to double their advantage. They paid a high price for their profligacy when Teemu Pukki levelled with 10 minutes remaining. But credit Latics for finishing with a flourish, with Leon Clarke seeing a stoppage-time header ruled out by a highly-contentous offside flag. Having made four changes and tweaked the system again, Cook says Latics have set the standard now for the rest of the season. "Sometimes when you watch us in a game, we just become a little bit indifferent," he said. "You're watching us thinking: 'What is that team trying to do. "Today we picked a team that was designed to do one thing, one job - to press them high up and have the energy to keep doing it. "And I thought the lads who started the game implemented that plan absolutely excellently. "Most teams sit off Norwich, and we didn't want to do that. "We want to build a team here and a club that's going forward, and wins football games on the front foot. "Sometimes it comes down to personnel, and when you've got personnel of the quality of the striker Norwich have, it's not always easy." The draw sees the gap to third-bottom Rotherham extended to two points, with four matches to go. And Cook was left with a feeling of 'what might have been' that it wasn't four. "I thought we did enough to win the game if I'm being really truthful," he added. "We've gone up against a very, very good side, they're excellent in everything they do, and we've matched them. "We've taken the game to them, we've engaged them, we've pressed them at the top end of the pitch and we're unlucky not to have beaten them. "All the lads who came in have worked so hard to get that result. "While there's a small amount of disappointment not to have got the win, when you're playing teams like that, we're happy with that. "I wish it could have been four points, I think that would have allowed us to enjoy the rest of the day's sport with a bit more happiness. "Unfortunately, it's only two, but to go eight games unbeaten at home, we're doing something right." Cook is keeping his fingers crossed defender Danny Fox has escaped serious injury after limping off at the end. "We'll just wait and see, but these injuries are very tough to take at this stage of the season," the Latics boss added. "If you lose players now, the likelihood is you could be in a bother so we'll wait and see."